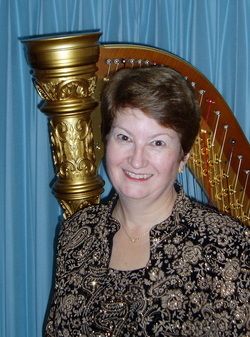 Ellen Grafius began her harp studies with Velma Froude at Cass Technical High School in Detroit, Michigan. She received a B. Mus. Ed. degree from the Honor’s College at Michigan State University and has done additional harp study with Miss Froude, Patricia Terry Ross (instructor, Wayne State University), Joan Holland (instructor, University of Michigan) and Alice Chalifoux (Salzedo School). Ms. Grafius has taught at Blue Lake Fine Arts Camp and Michigan State University. She has private students in the Kalamazoo and East Lansing areas and is on the faculty at Kalamazoo College and Albion College. She has performed with orchestras in Lansing, Midland, Kalamazoo, Owosso, Grand Rapids, and Corvallis, Oregon. A busy free-lance harpist in the Lansing area, she plays numerous weddings and receptions and did a 10-year stint for the Kellogg Center’s Sunday brunch. She has performed at the Michigan Governor’s Mansion and is the featured artist in the Capitol Dome each year for Lansing’s Silver Bells in the City.